It’s easy to see why the Fairline Targa 29 is such a popular sports cruiser. This example is looking particularly good. Clean & tidy with a high equipment spec, the owner has recently spent in the region of £10k maintaining & improving this vessel. Not only does it come with twin high performance Volvo Penta KAD diesel engines to give all the speed and performance you desire, a new bow thruster has recently been fitted to make berthing in windy / tight marinas an enjoyable experience too. Whilst out of the water in September/October 2018, two new Duo Props were fitted along with new throttle cables, new hydraulic hoses, a new smart battery charger and a complete set of new anodes. During this time the engines, gearboxes and drive legs were also serviced and the hull was scrubbed and anti-fouled. The accommodation provides a lovely living space and is bright, clean and surprisingly roomy. With berths for four down below in two cabins, there is also the option of an additional double berth in the cockpit. The galley is well equipped, there is hot / cold water throughout and cabin heating with vents into both cabins and enclosed cockpit. Out in the cockpit there is plenty of entertaining space, seating and a brand new rotating helm seat. There’s also plenty of room for sunbathing on the forward deck, in the cockpit or on the huge swim platform. This vessel has all you need for fun in the sun and makes for a fast, comfortable weekender. 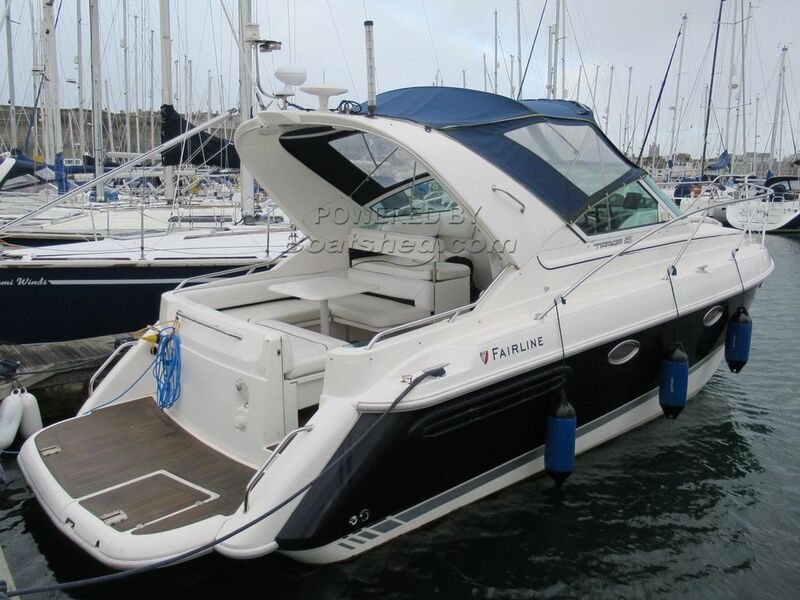 This Fairline Targa 29 has been personally photographed and viewed by Billy & Jo Hallam of Boatshed Plymouth. Click here for contact details.